Arsenal faced the arduous task of overpowering an in-form Manchester City side in their opening fixture of the 2018/19 Premier League campaign at the Emirates stadium. It was a hard-fought affair but the defending champions came out as winners in their first encounter of the season. Raheem Sterling and Bernardo Silva scored the goals for the Cityzens as they defeated the Gunners, who were unable to retaliate. While the Premier League champions looked playing in complete synchronization, the North London club, who had a few newcomers in their team, struggled to put their effort together. None of the Arsenal players looked in outstanding form but one player who faced the blame for letting in the first goal for his team was the new boy Matteo Guendouzi. The 19-year-old Frenchman, who was a surprise inclusion during the summer transfer window by Unai Emery, was handed a start in Arsenal’s first match this season. It was not a bad night for the player but he was blamed by his teammates Hector Bellerin and Shkodran Mustafi for letting in Sterling to score the first goal of the night. 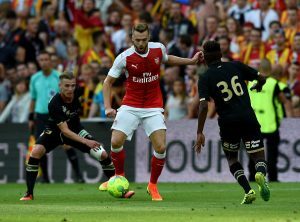 The incident saw the English international taking on the Arsenal defence from the right flank and cutting inside. However, as per the Metro, the Spanish right-back Bellerin was the one to be blamed in the first place to let Sterling cut in from the flank. As he started to cut in, he faced the young Frenchman, who could not do enough to stop him from scoring the goal. After the ball was into the net, it was seen that Guendouzi was being given some hard talk by his fellow teammates Mustafi and Bellerin. However, this must be a lesson for the player to remember in the upcoming and use it to develop his game. Arsenal To Rival Chelsea For The Signature Of This Juventus Defender: A Good Fit For Emery? 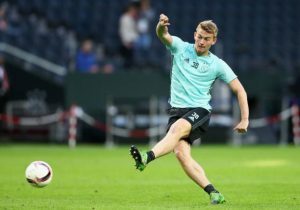 Celtic Readying A Move For This Promising Arsenal Striker: Right Choice By Rodgers? Jean Michael Seri: Should Arsenal Sign This Unknown Midfielder On The Rise From Nice? 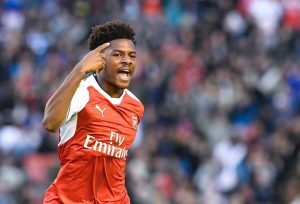 Arsenal Extend Contract Of Out Of Favour Defender: What Does It Mean For His Future? Crystal Palace Eyeing An Ambitious Move For This English Dazzler: Can De Boer Pull This Off?